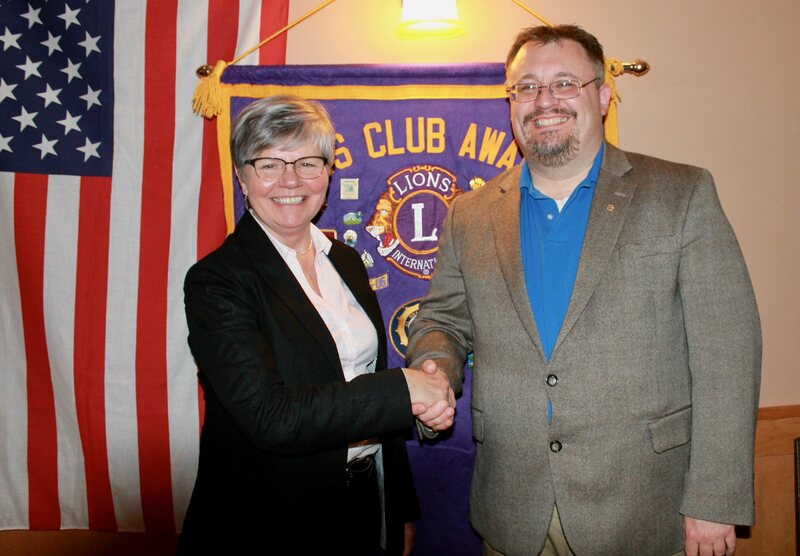 FULTON, NY – Linda Eagan, administrative director, Fulton Block Builders, made a presentation at at the Fulton Lions club’s April meeting. 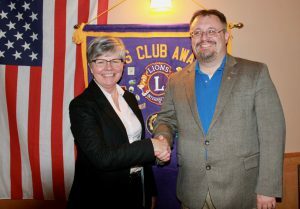 She was joined by Fulton Lions President Dave Guyer. Linda Eagan and Dave Guyer. Eagan outlined the grassroots neighborhood revitalization program, which has exceeded its first year fundraising goals and received more than 200 pre-applications for participation. Approved neighborhood groups receive reimbursement of up to $1,000 for renovations to their homes. For complete information, visit www.fultonblockbuilders.com. The Fulton Lions Club, also known for its Lions Loot Sweepstakes, (April 30), Lions Mane Event Comedy Night, and annual Duck Derby, provides financial assistance for those in need of eyeglasses, eye exams, and hearing aids to residents in the Greater Fulton area.